Eleven Years Ago Yesterday, I Married my Best Friend. So, what did we do for our anniversary? Sat across from each other in the living room with our dueling laptops to see who got their post written first! Then we celebrated with dinner and a movie. I love writing, but it can take me the whole day to put one of these things together! Arrgghh! I need to speed up, or just retire and be a full-time writer. How does Kim do it? But there was Steve across the room, tap-tap-tapping away. I had to get tapping too. Nothing like a little marital competition to get the juices flowing. Steve is actually a really good writer. I did not know this about him before we were married. I’m an English teacher for goodness sake! He, on the other hand, actually writes. Sigh. He’s thoughtful about it, like he is about everything he does. He types with two fingers. I type with twelve. I discovered his gift for words in the MIDDLE of our wedding. 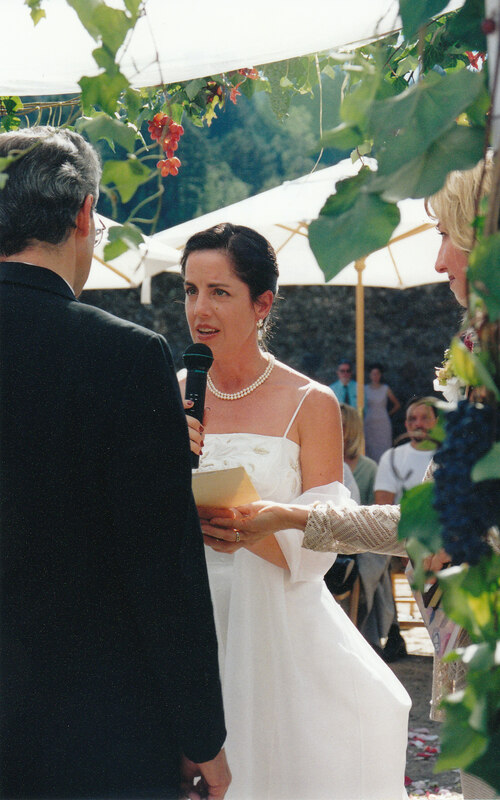 We each had written a portion of our vows, then read them to each other in the ceremony. I had been rushed with all the wedding preparations and had put off writing the vows (Procrastination is the name of one of my personal gremlins). Steve had given himself some time and space to hear his own heart in what he wanted to say. So when he read his vows to me during the ceremony, his words were so deep, intimate, personal, and straight out of his heart with tears in his eyes, I began to tremble. 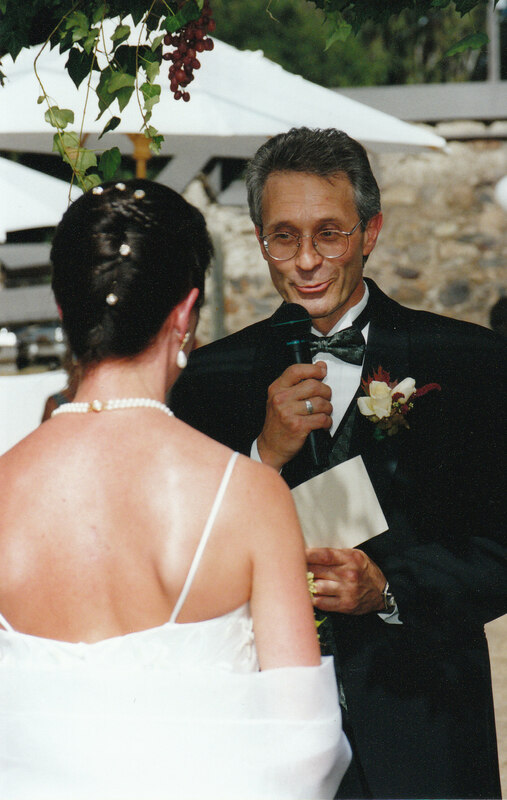 First because I was so moved by the huge pulsating heart that came with this man I was marrying. And second because I was next! My vows felt flat and superficial compared to his. Not that we should be comparing or anything (but Comparison is the name of another personal gremlin). What I learned from my husband that day was, take the time to go deep, and marry a man with a giant heart! So, here’s where I put in my shameless plug for my Break Through Into Love coaching group. This is an opportunity for single women over 30 to experience the benefits of working with a professional coach, while creating a small community who can support each other along the way. In preparation, I’ve been reading the book Conscious Dating by David Steele. 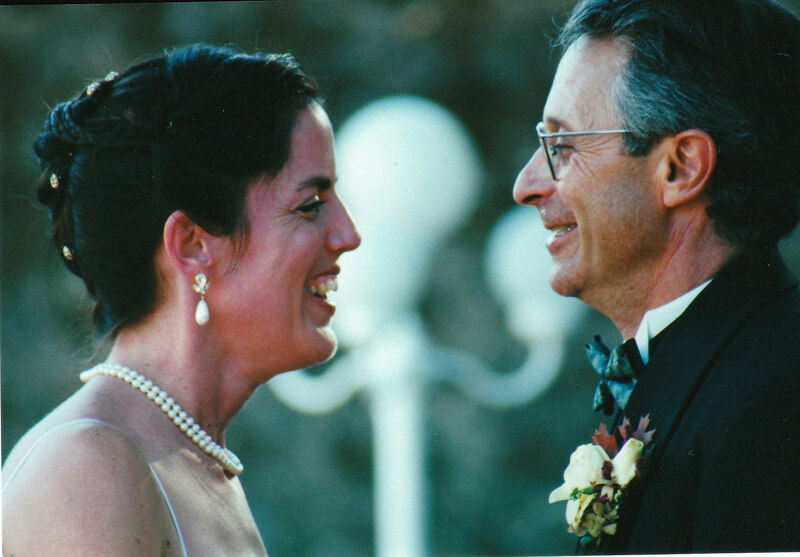 As I read, I’m beginning to get a clearer picture about why I made Steve wait five long years – and why it took me until I was 40 (FORTY) to get married. We all get stuck at times in patterns that keep us from living the life we were created for. Sometimes, all it takes is a small shift in our perspective and new choices appear that we didn’t know we had. Ah, if only…. We might be celebrating our fifteenth anniversary today! I’m realizing that for most of my 20s and 30s I was unconsciously dating. Drifting into and out of whatever relationship presented itself. I longed oh so much to fall in love and to have someone sweep me off my feet. But I see now that I was for most of those two decades incapable of such a feat. Here’s why. A. I had a false image of myself. I had constructed a fantasy out of who I thought the people I looked up to wanted me to be. B. Because of A., I had no idea how to love another; I was too busy looking for someone who would help me fulfill my fantasy. C. Because of B., I got into relationships with men I didn’t love. And of course, it never worked. D. Because of C., I broke a lot of hearts: Genuine, honest men, who cared about me and were seriously looking for a life partner. Eventually, as they would get more serious, I would get more panicky until I would break it off. Finally, after hitting the wall in a disastrous relationship, I stopped – swore off men, and began meeting informally with a coach, and my entire perspective on life began to shift. When I began to let go of the false image of myself, and lift my eyes outward, I began to see Steve, maybe for the first time. When I stopped focusing on who he isn’t, I began to see and appreciate who he is. The more I let go of my old perspective, the more deeply in love with him I fell. Within a year, we were engaged. That’s why I’m such a believer in coaching and why I want to offer the opportunity to single women over 30 to gain clarity about this most important choice. If you’re stuck in an unproductive pattern in your relationships, check in with your own heart. What view of yourself are you trying to hold on to? What might be possible if you were to release it? I’d love to hear your comments. If you know a single woman over 30 who lives in Sonoma County and who is looking forward to life-long love, please let her know about the Break Through Into Love group coaching program beginning October 19. And let her know about my free Evening of Hope, happening this Wednesday, October 5, where she’ll get to experience new possibilities in her life and perspective. Steve with the giant heart early on recognized a kindred spirit in you and so the pursuit began.